When the New Horizons spacecraft passes within a mere 7,750 miles of Pluto on Tuesday, many at the University of Central Florida will be cheering for the historic flight and its leader, S. Alan Stern. Stern, whose advocacy, tenacity and some would say sheer bull-headedness are largely to credit for the selection and execution of NASA’s farthest-ever look into deep space, is chief science officer for UCF’s Florida Space Institute (FSI). He also served as interim director of FSI from 2011-2013, establishing nearly $1 million in funding for space-related research projects and facilitated the center’s move, after 22 years, from Merritt Island to the Central Florida Research Park. He was also instrumental in recruiting the center’s current director, Ramon Lugo. Both Stern and Lugo have extensive experience working for, and with, NASA. “We know that research is the key to keeping UCF and Florida in the forefront of space exploration,” Stern said when he accepted that role. UCF is still benefiting from that focus, said MJ Soileau, UCF’s vice president for research & commercialization and Stern’s boss during that interim stint. A special edition of UCF’s science café last month featuring Stern talking about New Horizons attracted more than 200 attendees, including many students excited about the next generation of space exploration. “Alan accomplishes more in a week than many do in a year – his continued involvement with FSI helps elevate some of the already outstanding research being done across the state,” Soileau said. On Tuesday Soileau and Lugo will join Stern and what is expected to be a capacity crowd of scientists and press at the Johns Hopkins Applied Physics Laboratory in Laurel, Maryland, where New Horizons was designed and built and which serves as the mission’s control room. While the observers will get some visual confirmation of the approach on Tuesday, the highest- resolution images and other data will take months to fully process and download. The closest approach will occur at 7:49:57 EDT. 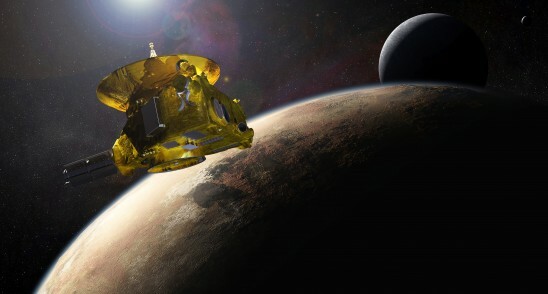 The New Horizons mission heralds a series of firsts for NASA – it is the first mission to Pluto and the surrounding Kuiper Belt, it has traveled a longer time (9 and a half years) and farther away (4.67 billion miles) than any other space mission in history, and it has already returned the first color images of Pluto.